Some of the small roles that stood out to me is Gary Merrill as our mobster boss and Karl Malden as the cop who just got promoted to lieutenant over Dana Andrews. This story starts out with Tierney who is accompanied by two other men playing an illegal game of craps. One of them is winning big, real big. He is up $19,000! Tierney starts to go home and one of the men says they can not go yet. He smacks her and the man up $19 grand punches him. The two men fight and our lucky gambler is left unconscious on a couch. We then go to the police headquarters where a murder is reported. Andrews and his partner leave to investigate the case. They find the luck gambler dead on the floor, stabbed in the heart. This is in Merrill’s room where the illegal craps game was being played. We soon see Merrill and Andrews do not like each other and have a history. Andrews goes to the apartment of the other man who was with Tierney and who Merrill says killed our gambler. There is a fight and Andrews accidentally kills his only suspect in a fist fight. Now Andrews has to cover the murder he committed. Will he get away with it? Will Merrill get away running his illegal game and possibly murder himself? How will Tierney react to all of this? This is another great noir from Andrews, Tierney and Preminger. I felt it was a darker more gritty noir then Laura and well worth watching. The fight scenes are not flashy and play more realistically then what we get today. 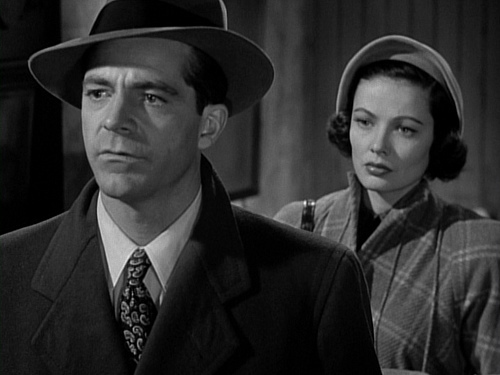 The style of the film is quintessential noir. This was Preminger’s last of 4 noir films he made for 20th Century Fox in the 1940’s and is one of the best. He went on to make more noir, crime and thriller films well worth watching for other studios. This film is a must see for all classic film noir fans and all fans of film should give it a viewing. Ooh, another noir I haven’t seen but must. Thanks for your engaging review! P.S. Found the film on YouTube and am watching it right now! Nice writeup of a great movie — many thanks. And that lower screengrab is a thing of beauty!